Get a healthy start to your weekend with a happy hour yoga class at the Springs. Settle in for a slow flow and deep stretching set to an electronic beat at the Arts District wellness center. The class is part of the Springs’ National Yoga Month celebration, which offers unlimited classes this month for only $50. Afterwards, head to NerdMelt for the Friday Forty. This comedian-fueled game show mixes together current affairs questions with a little bit of liquid courage. Scott Gimple and Dave Holmes—yes, the former MTV VJ—welcome Dan Harmon and Chris Hardwick to down a few before tackling 40 questions about the past seven days. Eat lunch for a good cause on Saturday at the annual L.A. Loves Alex's Lemonade fundraiser. Chef Suzanne Goin—along with business partner Caroline Styne of Lucques and husband David Lentz of Hungry Cat—host the all-you-can-eat cookout at UCLA with chefs including Giada De Laurentiis, Ludo Lefebvre and Ray Garcia, as well as a slew of premier mixologists. While you're on the Westside, take a drive along the self-guided LA Beach Cities Modern Home Tour. Take a peek into eight handsome, modern residences scattered across Venice, Santa Monica and Hermosa Beach. You'll have to drive yourself between locations, but a ticket allows access into each house where its homeowners and architects will extol the virtues of living in a dream home. 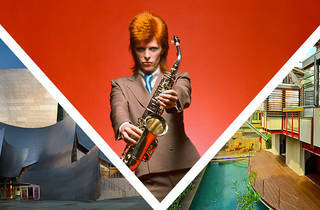 Swing by the Taschen Gallery before for its newest show, Mick Rock: Shooting for Stardust, the Rise of David Bowie & Co. 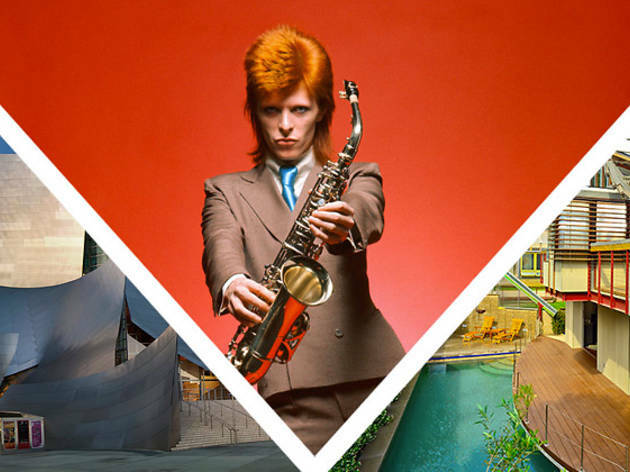 The exhibition showcases rare and unseen photographs of Bowie and his crew taken by prolific music photographer Mick Rock during the Ziggy Stardust years. If you're up for something a little bit more titillating, head over at the El Rey, where badass beauty queens the SuicideGirls are back with their Blackheart Burlesque tour. The troupe will perform new stripteases set to pop culture lampoons. Spend the afternoon at LACMA on Sunday for the opening of its Frank Gehry retrospective. The exhibition examines the Walt Disney Concert Hall architect's entire career through concept sketches and some seriously impressive models. While you're there, make sure to snag a seat for a conversation with Frank Gehry. Though the free event is sold out, a limited number of standby seats will be available for the chat between Gehry and architecture critic and biographer Paul Goldberger. We'd rather you not spend the rest of your weekend waiting in line, but this opportunity is too good to pass up: get over to UCB Sunset for a performance of Asssscat featuring the entire UCB 4—that's founding members Matt Walsh, Matt Besser, Ian Roberts and Amy Poehler. Sunday performances of the long-running improv show are always free and first-come, first-served, so make sure to show up early.